Steam baby potatoes in a pressure cooker or micro wave oven. Cool and remove skins of potatoes and cut big ones into two pieces. Chop onion, tomatoes, green chilly and garlic. In a hot pan add oil, heat well, add mustard seeds, when it splutter add chopped onion, garlic, green chilly, salt and sauté, lower flame and add chilly powder, coriander powder, turmeric, garam masala and sauté, add chopped tomato and green pea, stir well, cover and cook, till tomatoes smashed to paste form. 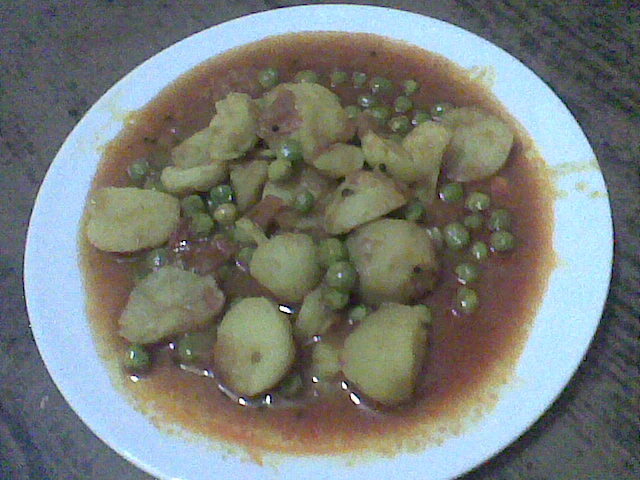 The green peas also cook at these time with tomatoes. After smashing tomatoes add necessary water and boil lower flame and cook till green peas become tender. Add steamed potatoes and salt to this and boil, lower flame for 5 minutes. Now the dish is ready to serve. Adding salt to onion help to sauté it quickly. Adding tomatoes to main dish or side dish is increase its taste. Use mustard or cumin seeds according to your taste for seasoning. Grinding tomatoes and sauté give more thickness to the gravy.